1. Do you think it would be a good idea to have a dress for my wedding reception so I can dance comfortably? I’m two months away from my wedding and starting to think I should find a short dress for dancing!! Any suggestions would be helpful! Brooke: I had two dresses, and it was (still) one of my favorite decisions b/c my ceremony dress was not very comfortable and super heavy. I think it depends on the dress you already have – if it’s not comfortable, I would say get a party dress if you want to dance a lot and be comfortable! Some I love: here (stunning! ), here, and here (a little more expensive, but looks gorgeous and comfy!). 2. I’m surprising my hubby with a trip to Dallas to see his beloved Cowboys. What are some fun places to stay, places to eat and things to do over a long weekend? We are 32 and love to have drinks out but won’t be hitting up the clubbing scene. Lol well I’ve never been to a club here so that’s good you don’t need recs for those 😉 For hotels I love the Joule, Hotel Crescent, and Hotel Zaza. Some of my favorite places to eat/drink are Katy Trail Ice House (fun to walk the trail then stop there! ), Shinsei, HG Sply Co, Up On Knox, Truck Yard, Uchi, Trulucks, and Gung Ho. My favorite areas of the city are Greenville, Uptown, and Knox/Henderson. 3. Best remedies for breakouts? I can’t seem to get my chin under control – ugh! Meggan: Ever since I started taking this probiotic a few months ago I’ve had like no breakouts. And my chin was my problem area too! Brooke: I struggled so bad with acne on my chin for the longest time after having Avery. I saw results when I started to cut dairy and then was blown away after I did whole 30. It was the first time (since having her) that my skin was completely clear. You can read about that here. For me, dairy is the culprit. Have you tried cutting dairy? I actually met Dr. Dennis Gross at an event during that time, and he told me I needed to use his treatment pads and get an oil-free moisturizer. Two additional products that really helped me are this mask and these treatment pads. These are the products I would definitely recommend trying! 4. Casual dress ideas for Easter? A few we’re loving are here, here (would be cute with a jean jacket and sandals), here, and here! 5. At what age did/are you ladies sending your kids to school? I currently have an almost two year old and there’s a two day a week, three hour preschool available in my town. I am currently sending my child to an in-home daycare and debating if I should send them to preschool next year or just wait until they are 3? I want to make sure they get the social skills and are not behind, which I think daycare really helps with the sharing and playing, but they aren’t necessarily learning that much. Two seems so young to me. Do you have any suggestions or advice on what you did/would do? Brooke: We sent Sophia when she turned three and doing the same with Avery. Sophia was in gymnastics and ballet when she was two and the preschools around us are play-based, so she was getting the same socialization that she would have in school. I don’t think there’s a “wrong” time to send kids to preschool, but if your child is in daycare, it’s probably very similar to what a two-year-old preschool program would be. I would recommend visiting the school just to feel it out and see what you think! Don’t think you can go wrong either way. Meggan: We sent Cam last fall (he turned 2 in June) and he’s in the young two’s and three’s class which is two days a week for 3 hours. We felt like Camden was ready and needed socialization since he’s home with me everyday. It’s definitely similar to daycare – they do different activities and follow a schedule but it’s nothing too stressful for him lol. And he loves going which is great! 6. Any good book suggestions? We recently did a post on some of our current favorite books! You can find that here. A few other favorites are The Woman in the Window, The Party, and Behind Closed Doors. 7. Brooke – did you lose the weight you were wanting to lose?! If so how much did you lose and how long did it take you? Uhg no! I had lost about 5 pounds, but then moving and packing happened (and lots of takeout) and I gained it all back. I’ve only cooked several meals since we moved, but I’m finally getting back on track. And I’m sure you’ve seen the chocolate eggs on Insta stories which are definitely not helping – I told myself I’m done with the eggs…no more grocery store runs for them lol! Right now I have at least 10 pounds to lose which is the most I’ve ever had to lose (except after pregnancy). I have another meeting with my health coach coming up, and I just got back to the gym so I will definitely keep you posted on my process/progress. 8. 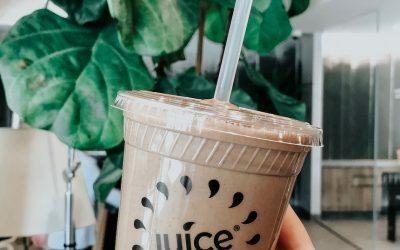 What are some of your favorite boutiques in Dallas and Chicago? Honestly I don’t do a ton of boutique shopping but in Dallas I like popping into Gypsy Wagon, Esther Penn, Jade & Clover, and Kittsona. 9. What’s the perspective on the Valentino Rockstuds? I have several pair that while I don’t feel are out of style at all (one is a fabulous pair of pumps… and the other the classic caged…), if these are that out of style I want to be sure I’m realistic! I’m a huge Manolo fan, and have a bunch and could not agree more that going classic is the Manolo way! We always say wear what you love, so if you love them, rock them! We don’t think they’re “out,” but they have definitely had their moment in the spotlight! We would probably keep them! 10. Brooke – I know you have a peloton bike, but I feel like I never really see you talk about it or mention using it for home workouts. I’ve been on the fence about getting one, do you not like the bike/setup? Any insight would be wonderful! Also, curious, do you still see a health coach and what is/was your experience with that? I love my Peloton, but if you read the above you will see that I’ve been struggling making time for it lately. I was using it 2-3 times/week before our move and it’s so great, you really feel like you’re in a spin class which I love! There are so many classes/instructors to choose from, live and pre-recorded classes and they’re updated daily, so you’re never out of options. One of my shoes went missing during our move which is why I haven’t ridden it recently lol. I have a few lingering boxes in my office that I need to go through before I give up and buy a new pair of shoes – fingers crossed. If you like to spin, I think you would love the Peloton! Yes I’m still meeting with my health coach, have a couple sessions left with her then I’m going to do a recap! 11. What are your favorite spring jackets? Loving this jean jacket, this lightweight trench, this suede moto, this anorak jacket, and this trench. 12. As a busy working mom in my thirties I feel like it’s hard to stay up on trends, last week’s #coffeetalk made me question if the Rockstuds I just got are on their way out lol. Would you do a list (or maybe even a whole post) of some trends you think are past their prime as well as some trends you see coming for this year? We will definitely do a post on this – stay tuned! 13. 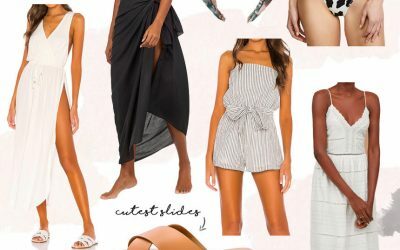 I’m going to Greece this summer and am looking for some outfit suggestions! Jealouuus! Love this jumpsuit, this dress, these slides, this set, this dress (cute for exploring), this hat, these shorts, this blouse, these wedges, and this maxi dress. 14. Could you please suggest some nice office wear business casual and formal outfits. I’m attending a lot of business conferences and meetings so I’m always looking for options that are cute but not very expensive. 15. I’m due in September but also have my sister’s bridal shower. What are some cute options I can wear assuming I’m still pregnant or if I just recently had the baby? This dress is pretty, love this one, and this one (nursing friendly too!). If you’re not pregnant we would do a flowy maxi like this one! 16. Favorite tops for going out to dinner, etc that aren’t sweaters but not summer tops? Some top ideas for this in between weather. Obsessed with this peplum top, this bodysuit, this ruffle top, this off-the-shoulder, and this blouse. 17. Meggan – I know you’ve talked about your anxiety in the past and your decision to ultimately use medication. Were the side effects in the beginning bad? If so, how long did they last until you felt better and like yourself again? Honestly I started taking it so long ago (college) that I don’t really remember if I had any side effects (if any!). I think it might of made me a little tired/loopy at first but your doctor will help find the right medication/dosage for you! 18. I’m wondering if you have any suggestions for a cute dress for college graduation..mature, but still fun and young looking. I’m abroad until a few days before and want to be sure I have something to wear! Below or close to $100. This dress is always a good option and comes in a few colors to chose from! A few other options under $100: here, here, and here! 19. Brooke – where did you find that juju hat in the acrylic frame you posted to instastories? I found it at Holly Hunt during a sample sale (looks like they may have one left if you’re in the NY area?!). I can’t find any framed online, but a few juju hats I’m loving – one, two, and three. 20. A co-worker and friend is getting married in a few months, and I have no idea what’s a reasonable or appropriate amount for a cash gift. All of my friends are married with kids by now so the last wedding I went to was easily over 5 years ago. The wedding is going to be nice but not over-the-top, local, and she’s been a friend for about a year and a half. Any suggestions for ranges or what’s “typical”? We don’t think there is a set or typical amount to give for a cash gift. It doesn’t sound like she’s one of your long time best friends, so you shouldn’t feel obligated to give a huge gift. The Knot suggests $50-$75 for coworkers, distant relatives, or casual friends so maybe somewhere in that range! 21. Wondering what recommendations you have for an investment work purse, possibly something in the $300 range and can fit a laptop. Love this one, this one (in black), and this one! 22. My mom and I are going to the Kentucky Derby this year for her 60th birthday. I need some hat and dress options for a 30 year old and 60 year old please! For you – this dress, this one, and this one. For your mom – this dress, this dress, this one, and this one. Hats – one, two, three (this shop if you want to go all out!). 23. I’m visiting NYC for my birthday this year. This will be my first time there in the summer – what are some of your favorite NYC summertime activities (will be there over the 4th of July). Summer in the city is so much fun! Definitely need to go to some rooftops for cocktails and views! Pod 39, Standard Hotel rooftop, Novotel, Catch in Meatpacking (for rooftop dinner), and The Met rooftop (during the day). Definitely walk the Highline at sunset, visit Central Park (a given, but so pretty in the summer), Smorgusburg, North River Lobster Co, take a boat tour or a food cruise (I thought I would hate this, but actually loved it), and definitely try to find a great spot to watch the fireworks! I’m not sure where the best place is (we go to Iowa for the 4th of July), but I would look into that, b/c I’ve heard the fireworks in NYC are amazing! Have fun and happy early birthday! 24. I would love to know your thoughts on where to save vs splurge in a home reno. Love following along with both of your homes…major inspo! 25. I am getting married this summer and have three showers, one in April and two in June. With this crazy weather in Illinois, I am having a difficult time finding something to wear! Do you guys have any recommendations for them? I am nervous that it will end up being a little chilly for the April shower and my outfit will be a total fail!! I’m also heading to NOLA in June for my bachelorette party and am open to any and all recommendations for some super cute outfits! For your shower(s), we would just wear a dress and a trench over if you need when you’re outside for the one in April (assuming your shower is indoors). 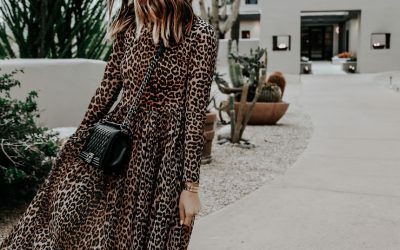 Dresses we’re loving – one, two (obsessed! maybe for the April shower), three, and four. 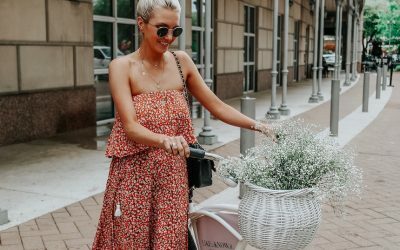 For the bachelorette – this romper, this mini, and this dress (okay, amazing details!). Haaaay! One of my closest girlfriends is turning 30 in a few weeks. Any ideas…? She’s about 15 weeks pregnant so was thinking, a prenatal massage …HELP! Side note… do either of you have the gucci soho disco bag or ysl blogger bag. If so, does it keep its shape? I’m looking for some new bras/bralettes. I want them to be cute but definitely still comfortable and provide coverage. Do you two have any suggestions?! Thanks! I work in a hospital but work in a patient care area so I need closed toed shoes. I wear business casual cloths. I would love recommendations for closed toed shoes that would go with a wide variety of work outfits for summer (dresses, dress pants, and leggings). Thanks!! You’ve talked about your anxiety – have you ever found any self-help books that you’ve enjoyed? Love your blog! I’m going to Munich, Germany in early June and all the websites say Germany weather will be in the 70s with night temps in the low 60s. I’m having a hard time trying to find trendy/reusable outfits to piece together for those temps. Any suggestions would be helpful! Thanks! Loving that mini bag in white! What advice would you give to your younger/teenage self? I’m going to Boca Raton, Florida in May and am looking for some outfit suggestions! I love y’all’s coffee talk series so much. One of the blog posts I look forward to reading every week! I’m thinking about planning a surprise weekend trip for my hubby and me in the fall after I’m finished nursing my baby (we don’t get much alone time nowadays lol) and I was wondering if y’all have any places y’all would suggest for a fun, romantic weekend trip!